We are a leading Company in the provision of services for corporate (B2B) and retail (B2C) clients in the telecom industry – Telecom segment. We focus primarily on B2B clients due to the higher attractiveness and growth potential in the provision of services for this clientele. We believe that our large infrastructure built on modern technology, which is supported by a fiber optics network of approximately 61,277 km and is currently present in 16 states and 350 cities, coupled with our closer, customized – advisory-type – and efficient service, differentiate us in the market. In addition to the Telecom segment, we are also present in the Tech – BPO/IT Management segment providing BPO (Business Process Outsourcing) and technology support services and solutions to corporate clients. Our Telecom infrastructure covers Brazil’s main economic hubs, such as the states of Minas Gerais, São Paulo, Federal District, Rio de Janeiro, Mato Grosso do Sul, Goiás, Paraná, Santa Catarina and Rio Grande do Sul. The combination of this large infrastructure built on modern fiber optics technology, with products and services of renowned quality, in addition to our in-house, close and advisory customer service, is reflected in the high renewal rate of corporate contracts, which totaled 88.5% in 2017. According to a survey performed by Expertise in 2016, 94% of our large- and medium-sized B2B clients were satisfied or very satisfied with our products and services. Our B2C service was acknowledged by the ReclameAQUI site, which, in 2016, ranked us as no. 1 in the category “Best Companies for the Consumer – Telecom Industry”. In addition, in July 2017, we were once again ranked as the telecom service provider with the highest Customer Service Performance Index (“Índice de Desempenho no Atendimento” or IDA), according to the ranking of complaints against service providers prepared by the country’s regulatory agency (ANATEL). Our B2B offering is based on the combination of a wide infrastructure built on modern technology and supported by a network of approximately 61,277 km of fiber optics, broken down as follows: (a) 50,277 km with capillarity and access located in Brazil’s Southeast, South and Center-West regions, including 17,000 km in metropolitan areas and connecting over 3,300 buildings (on-net buildings); and (b) 11,000 km of a submarine communications cable – which is at its final phase of construction – connecting the cities of Santos (SP) and Fortaleza (CE) to Boca Raton (Florida, USA); and a portfolio of services, including dedicated IP data links, VoIP services, Ethernet services, clear channel, network security services, as well as standardized technology products providing a complete array of services, such as cloud, hosting, co-location, videoconference, managed services, virtual PABX, and Anti-DDoS. Our 34 regional offices ensure our closer proximity to our corporate clients. Our sales and advisory services areas have their own business units comprised by commercial and technical consultants, enabling us to grow in this market, in addition to delivering higher value-added to our clients. The B2B clients are the main growth focus of Algar Telecom. 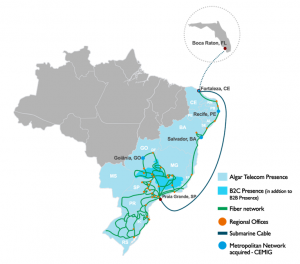 This highly attractive strategy – due to the low rates of penetration of connectivity data services in Brazil – is focused on the expansion of our networks into attractive regions, which are identified by georeferencing the number of potential corporate clients. We have invested in the densification of our installed networksallowing economies of scale and efficiency. In B2C, we are leaders in the provision of services in our original geographic region, where we have operated for over 60 years and which comprises 87 municipalities in the states of Minas Gerais, São Paulo, Goiás and Mato Grosso do Sul. In this region, our market share is as follows, according to data disclosed by ANATEL in December 2018: 76% in fixed broadband; 34% in Pay TV; and 33% in wireless telephone services. Through a converging x-play offer strategy, with possibilities for duo-play, triple-play, and quadruple-pay (fixed and mobile broadband, fixed and wireless telephone services, Pay TV and added-value services), we serve over 1.2 million B2C clients supported by a new mobile network (3G and 4G) in the 700Mhz, 850Mhz, 1,800Mhz and 2,100Mhz frequencies. We also have a wide fixed broadband network, with 428 thousand clients, of which 43% are Ultra-broadband (UBB) subscribers (with speeds ranging from 10Mbps to 200Mbps), with xDSL, HFC and GPON technologies. Our Tech – BPO/ IT Management segment has been in the corporate market for 19 years, with a portfolio focused on customer relationship management, technology environment and telecom services through digital transformation. Allied to a broad ecosystem of partners, the company has more than 70 offices and 2 data centers in Brazil and a team of 12 thousand professionals to think and rethink the experience of customers, their technology operations and telecom services, in order to to promote innovation and deliveries with excellence. With multi-channel service in more than six languages, the company operates throughout Latin America, with offices in Colombia, Argentina and Mexico. In 1954, in the city of Uberlândia, Minas Gerais, Alexandrino Garcia founded CTBC, currently Algar Telecom. In order to streamline the communication of those who lived in regions considered remote at that time, the Company acquired several municipal concessions in the neighboring cities. We were pioneers, in the countryside of Brazil, in the use of the microwave system. During the 1970s, we maintained private control, at a time when the command of most telephony service providers was taken over by the Brazilian government. In the 1980s, we expanded the offer of services to the countryside of Brazil. We started the contact center operations in Uberlândia (MG). We changed our corporate name from CTBC to Algar Telecom. We bought the 700 MHz frequency to provide 4G/LTE services. We acquired Optitel, a telecommunications company based in Getúlio Vargas, RS, covering 237 cities in the states of PR, SC and RS. Algar Telecom has incorporated Image Telecom TV Video Cabo Ltda. and consequently encompassed pay-tv services in its corporate purpose.